Hadi Rani Mahal is one of the superb pieces of architecture of Rajasthan. The walls and ceilings of this palace are adorned with antique carvings and scriptures. 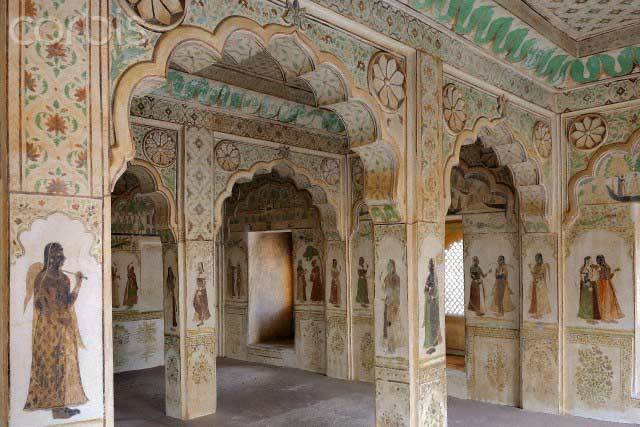 A Beautiful collection of mural paintings, which depict the Queen Hadi Rani with her numerous attendants are still there inside the palace.Located in the Nagaur fort, it is one of the jewels of Nagaur city. Named after Hadi Rani who sacrificed her life to motivate her husband for war. Hadi Rani the daughter of Hada Rajput was married to the Chundawat chief of the Salumbar region of Mewar. She is know for her amazing bravery to motivate her husband to join the war against the Mughals. When Mewar Kingdom was on the war with Aurangzeb, the Cheif of Mewar called him to join the battle, butmarried recently he hesitated to join the war. On seeing this Hadi Rani thought that she was the reason his husband is not acting like a real rajput. Before joining the war her husband asked her for a momento to carry in the war. And what she did was a mere act of bravery. She cut her head and put it on the plate for his husband. Seeing this her husband was devastated but carried the momento tied to his neck and went for the war. He fought bravely and made the mughal army flee from the region. By Road: Hadi Rani Mahal is located at the centre of Nagaur city. One can easily reach here by bus or taxi. By Rail: Hadi Rani Mahal is well connected through nearest Nagaur Railway station to major cities railway stations like Delhi, Agra, Mumbai, Chennai, Bikaner, Pali, Jaipur, Ahmedabad. By Air: Hadi Rani Mahal can be reach through nearest Jodhpur Airport (137 km) which is well connected with regular domestic flights to Delhi, Mumbai.